For some reason search isnt working so i cant seem to find any threads on this. Ton of info on retrofitting an upgraded rearview mirror (dimming and/or compass) for other models. Does anyone know if the e53 comes pre-wired (IE power for the EC) regardless of whats currently installed? I currently have a no nothing mirror and want to retrofit in my UGDO/Dimmer I pulled out of my e46 before I sold it. I dont want to pull everything apart to find out I have to re-do the harness to make it work, I will wait till the spring. I was able to use a power dimming mirror from my E39 in my Mother-in-law's 2001 3.0 X5. She does not have Premium but does have sport and CWP. The mirror is easy to R/R. Take a shot to see if you get lucky. for the sake of updating, I looked at the WDS and we only show one wiring diagram and harness for the mirror. I think the e46 had a couple, so that gives some creedence to the theory that its all pre wired. I guess I will find out later today! If I had to take a guess...I'd say that you're going to have a 99% chance that it's going to work. Since the e46/e39/e38/e53 were all built during the same production range and have basically the same options & features built upon the same BMW electronic communication bus...again, a successful outcome is eminent. I installed an e38 EC rear view mirror in my old e34 525iT and all of the mirror stuff worked without incident. That scenario was similar to yours in that the e34 had a plan non electrical rear view mirror. But when I pulled the sunroof access panel...there was an electrical harness tied off in a bundle of wires above the headliner which mated up with the electrical plug in the e38's EC rear view mirror. The only thing I had to work around was finding the wiring pins that controlled the central locking (FZV) because the e38 & e34 had different central locking set-ups. The e34 had older generation locking system used in the e32/e34/e28/e23/e30 era. More than likely this won't be an issue for you due to the same communication bus set-up between the e46 & e53. 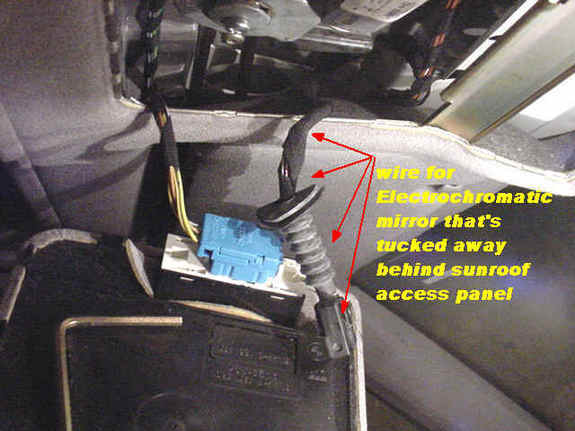 If you were trying to use a mirror from the e38...you may have to switch/pull the wiring from the electrical connector for the DWA (anti-theft alarm) red LED since the e38's LED is located on top of the dash instead of being incorporated into the "clown nose" on the bottom of the mirror. Please do keep us updated to your outcome. TIP: dont' forget to cover the sensor (like with your finger) that faces the windshield when testing the sensor on the front of the mirror with light. The sensor on the rear of the mirror (the ambient light sensor) is used to darken the mirror as well as the one on the front. The ambient sensor tells the mirror that it is dark enough to dim if bright light is shined on the front sensor. Last edited by Qsilver7; 11-16-2012 at 12:13 PM. for history's sake, I can say that on my facelift 04, all of the wiring and everything is in the harness. I now have compass and dimming. I have not tried the reverse function yet (where it stops dimming on reverse, it requires wiring to LCM to read the light position, but I suspect its there). So, lets just say that you can retrofit any of the normal BMW mirrors, UGDO, EC, compass et al, and the wiring is already there. Ahh...the sweet joy of success. Thanks for posting back that it all worked out. I realize this is an old thread but I just wanted to pick the brains of the gurus that may know about this retrofit. 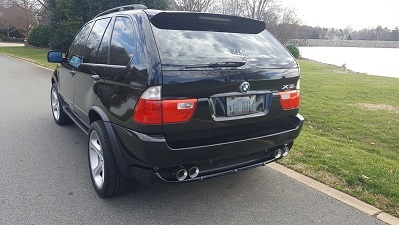 I did the compass auto dim clown nose upgrade on my e46 from an X5 and while reading all the horror stories in the e46fanatics forum about the BMW assist (SOS) issues. Anyone that had the SOS on their car would burn out the electro chromatic film in the mirror due to wiring. Is there any of the same issues on the X5? Anyone that had the SOS on their car would burn out the electro chromatic film in the mirror due to wiring. Is there any of the same issues on the X5? Not for me. Swapped mirrors in an E39 and two E53's. Hell, I even added elctrochromatic M5 mirrors to the E39. That was something like 15 yrs ago and I still don't have any troubles. But I do remember that we had to install the alarm in my wife's '02 E46. It was not included at the factory. Since the alarm, clown nose, and rear view mirror are all pretty much connected- or should be- it is reasonable to consider that an E46 without the Premium Package (which included a dimming mirror) would not have the wires ready to go. Why or how any of that would translate into blown electrochrome, I haven't the slightest. Thank you for your reply PropellerHead. I think the problem on the E46 with SOS was the actual SOS buttons were in the lower case of the mirror thus the wiring change. All good, I used my auto dim mirror I took out of my non SOS E46 and tested it on the X5. Works like a champ. Just waiting on the second compass auto dim to arrive and it's going in. Amazing what those E46 guys want for their mirrors, the X5 is the same mirror and sells on eBay for a fraction of what they want. I heard Land Rover uses a similar mirror too and they are even cheaper.